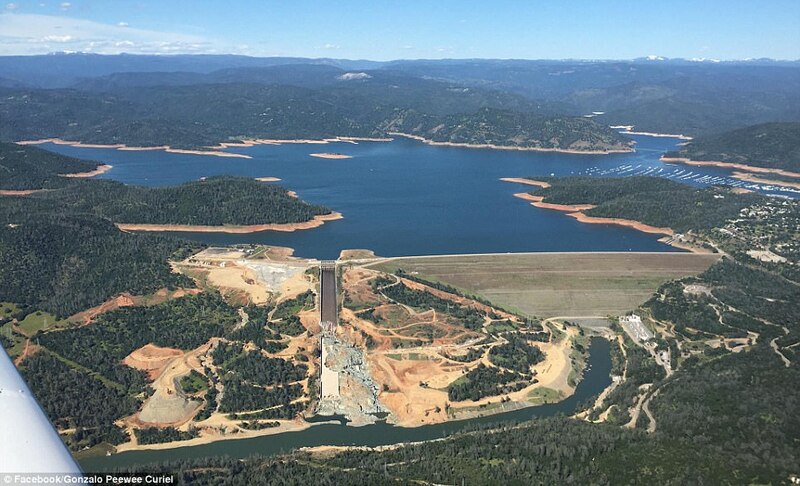 Remember the crisis earlier this year at the Oroville Dam? The overflow from California's winter of heavy rain threatened to overpower our country's tallest dam. A cascading failure of the dam's main gates, its primarily spillway AND its emergency spillway had the world watching hour by hour to see if a catastrophic breach was going to occur. Fortunately, the rains stopped long enough for the situation to be brought under control. The dam remains in place and repair crews have been working all spring and summer. But should we breathe easy at this point? Not at all, says dam safety expert Scott Cahill. Our readers will remember Scott from the excellent technical assessment he provided in the thick of the crisis earlier this year. In our earlier podcast with him, he explained how the real tragedy at Oroville was that for many years, small and affordable maintenance projects that easily could have prevented the crisis were diverted (in his estimation, the cost of making the needed repairs was quite small -- around $6 million. But for short-sighted reasons, the repairs were not funded; and now the bill to fix the resultant damage will likely be on the order of magnitude of over $200 million. Which does not factor in the environmental carnage caused by flooding downstream ecosystems with high-sediment water or the costs involved with evacuating the 200,000 residents living nearby the dam). They've begun the repairs on the bottom half of the spillway, but the tragedy and loss from the bottom half of the spillway failing has already been realized. No one is worried about the bottom half of the spillway. On the other hand, they've done nothing yet with the upper half of the spillway -- which is what would cause a catastrophic failure of the dam. It's amazing how much money they've already spent, and yet their priorities are such that they haven't abated the liability at all. So yes, we've made the bottom of the principal spillway, the concrete slues, more sound. But it's not the bottom of the dam that will fail, of course, it's the crest -- the top of it -- where the gates are. That's still highly suspect. There are additional issues involving the unwanted moving of water through the dam -- the so-called "green spots". These are areas where water is migrating through the dam, probably through the indigenous soils adjacent to it. I've walked on these [at Oroville] and you can stick your foot down, and like your backyard after a torrential rain, water actually comes up into the footprint after you remove your foot. This is not a good situation. I believe there is a lot of movement of water through that dam, including at the structure itself that houses the gates that control the flow down the principal spillway. There's nothing wrong with embankment dams in general, they're wonderful dams. But they rely on the mass of the earthen embankment itself to offset the forces that try to slide or rotate it into failure. When we see water migrating through a dam, it can potentially cause failure of the dam because it offsets the mass all that earth. Plus, there's a lot of river rock and sand in this embankment. River rock, as we all know, is round. Anyone can understand how a pile of round rocks, if the fines have been washed out from between them by water and the rocks then vibrated, for instance, by seismic activity, weakens the system. These concerns are very, very serious. I believe that this situation is occurring in multiple places across the Oroville dam -- and yet this is simply not being discussed. Click the play button below to listen to Chris' interview with Scott Cahill (41m:06s). Chris Martenson: Welcome everyone to this Peak Prosperity Podcast. I am your host Chris Martenson and it is Friday, August 18, 2017. We are going to revisit something that we talked a lot about last year. This is the Oroville Dam in Oroville, California. It probably slipped off your radar screens, but you remember at the time there was a huge crisis at the moment; people were evacuated in an emergency because the emergency spillway had overtopped and there was a danger that this dam could have failed, or at least the spillway could have failed. That still would have been twenty to thirty feet of water rushing down the narrow valley, wiping out a lot. It was a big crisis; now the crisis is past or has it. We are going to be talking again with the expert we talked with the first time, Scott Cahill, he is a dam contractor, tons of experience and he has actually been on the ground, had his boots there at Oroville. Scott Cahill, he is a construction expert, he is a writer, a public speaker, expert witness, sailor, pilot, a lot of experience. Forty plus years of construction and development experience, over half a billion dollars in completed projects and again most important part, he has been there at the dam to take a look at it. Scott, welcome back. Scott Cahill: Hey Chris, it is so great to be back with you thanks for having me buddy. Chris Martenson: Really, oh my pleasure. Let’s start; you have been to the dam haven’t you? You have been stomping around and poking at it. Tell us about that. Scott Cahill: Well, I did go to the dam; I got a chance to walk it, pretty much unimpeded, though observed. I saw what is going on of course I have kept up on the various documents including a recent document by a Doctor Bea out of California there. The gentleman is pretty much in sync with my own thinking. The oddity here Chris, is that when you and I talked a while back we had this near tragedy within moments of killing hundreds of thousands of people, potentially and as you say – now everything’s okay – and it certainly is not. The fact is that nothing yet is better than it was at that point. Scott Cahill: Nothing has been done. Chris Martenson: ….and I saw pictures of fixing. Scott Cahill: Yeah they have spent money they have poured concrete. Scott Cahill: They have begun the repairs on the bottom half of the spillway but the tragedy and loss from the bottom half of the spillway failing has already been realized. No one is worried about the bottom half of the spillway they have done nothing yet with the upper half of the spillway which is what would cause a catastrophic failure of the dam. So, it is amazing that they have spent this money and their priorities are such that they have not abated the liability at all. Chris Martenson: Really? So let’s talk about that because….so to remind people there is the main dam face itself. If I have my facts right, it is the tallest dam in the United States taller even than Hoover. There is a spillway, which is a place where water is normally supposed to come down, that suffered quite a bit of damage. People saw the damage pictures from that that was the concrete slues way that mostly got eaten away. And then there is an emergency spillway which is that big long piece, if you were facing the dam to the left and I guess the idea for that is if water ever got to that level it would just sort of sheet over the top of that. Which is the parts we are talking about now? Did I have that right? Scott Cahill: You do, right. You have the spillway itself, which failed under a moderate flow, and the bottom half of the spillway was effectively lost quickly. Then you had the emergency spillway, which topped as an uncontrolled spillway, so that whatever water comes in goes out across that spillway and it failed at three percent of its rated flow. So that is a pretty abysmal performance, to put it lightly. The spillways, certainly we have made the bottom of the principal spillway the concrete sluiceway spillway more sound, but it is not the bottom of it that will fail the dam. Of course, it is the crest, the top of it where the gates are. That is highly suspect and there are issues there that involve the moving of water through the dam. Of course, everyone that has kept up on this remembers the green spots as we have called it, so many times; an area where water is moving through the dam probably through the indigenous soils adjacent to it and the people responsible have said that the green spot, which exists yearlong including during droughts, is just from rainfall. All the engineers who are involved in this immediately responded that they do not buy that, but that is pretty much where they stand. They at least want people to believe that they believe that it is simply from rainfall causing grass to grow. I walked on it and you can stick your foot down, and like a backyard after a torrential rain, water actually comes up into the footprint after you remove your foot. It is not a good situation and I believe there is a lot of that movement of water through the dam, including at the structure itself that houses the gates, the tender gates or radio arm gates that control the flow down the principal spillway. Chris Martenson: Now Scott, hold on here, we are talking about the dam face itself. This is not the spillways but the dam face on the far right as we are facing this thing. This is again one of the tallest if not the tallest dam face in the United States. You are saying there is a green spot on their which is as I understand it is because of vegetation, which is green. The vegetation is there in a relatively dry part of the world normally because there is plenty of water there. So that is the green spot, right, it is just higher vegetation. Right? Scott Cahill: Exactly, yeah. It is in the left groin, which is facing downstream is on the left hand side. Scott Cahill: As you said looking at the dam from downstream it is on the right. Scott Cahill: And it is vegetation, which remains green even in drought. It is obvious, I think any thinking person that it is water, which is migrating through the dam. That can be marginally concerning or greatly concerning depending on after investigation how you find that water is moving. They have opted to simply discharge it as rainwater. Chris Martenson: And who is they in this story? Who is saying that? Scott Cahill: It is interesting, you know there is the California Dam Safety, which is the regulator. And California Dam Safety tells dam owners what they must do with their dam. They have the right to fine people incredible amounts of money and even imprison them if they do not bring their dams up to minimum standards when they are requested to do so. The California Dam Safety, though is a Division of the Department of Water Resources of California, which owns this dam. So effectively a guy is reporting to his boss who is asking the guy how did I do and the guy is responding gee boss you did great and he gets to keep his job. You have a regulator who is working for the dam owner which in my beliefs you do not have a regulator then. I believe that is part of the problem of the culture of that dam. It is significant, it is deep and it continues and even still you see that the greatest concerns of the dam have not been addressed. Chris Martenson: Now let’s talk again about how this dam face itself was constructed. It is not like Hoover Dam, which is out of poured concrete and rebar, is it? Scott Cahill: It is not, this is an earthen embankment dam. It is seven hundred and seventy feet long, it is a massive dam. Hoover is seven hundred feet tall so that gives you an idea of the magnitude of the structure. An earthen embankment dam, Hoover, I believe is a gravity arch dam. It is actually a structure that resists movement by spreading that force to the abutting rock. This one is a pile of dirt and there is nothing wrong with embankment dams, they are wonderful dams. But it lies on the mass of the earth itself to offset the forces that try to slide or rotate that embankment into failure. Those forces, though, are offset by what is called foundation pressure, which is water, moving through the dam. So that is one of the reasons that when we see water migrating through a dam, it can potentially cause failure of the dam because it offsets the mass of the earth that produces it. This was made from a number of tailings that were used that were taken when gold was taken out of the rivers. And therefore there is much river rock and sand in this embankment, which constitutes this mass. River rock, as we all know, is round and anyone can understand a pile of round rocks if the fines have been washed out of them by water moving through them then they are vibrated for instance by seismic activity. There are some concerns with this water moving through the dam, but they are very, very serious. By the way Chris, I do not believe it is just the left abutment because there is differential settlement and other things near the gate structure and on the other side of the dam, also, which are very concerning. I believe that this is a situation that is occurring in multiple places and that this is simply not being discussed. Chris Martenson: Alright; so just to complete this on that one side where the green patch is, the green spot, it looks like there is water moving through; we can easily dispense with the idea that this rainwater on the surface. And if that water is moving through, the concern is that then the fines have been washed away, so that actually water when it goes through stuff it erodes right. That is just the nature of water, it always does that. Chris Martenson: The concern is it is moving stuff and it is moving things that are resisting water flow, it might move more and more of it so more, and more water might flow over time, if I understand that right. So has there been a sense that this green spot has gotten larger or has it kind of always been there. What is the story with it? Scott Cahill: It has been there for a very long time but you are exactly right with what you are saying. It will only continue to worsen and the question is – at what rate will this occur? There is no doubt that this is what we call a failure mode; that if it is allowed to continue for an indefinite amount of time, it will cause the dam to fail. That is a reality and everyone I think really in their heart knows that. So, they say well it is not a big deal now they make up things like this rain theory, which is just ridiculous. But the reality of this is that we do not know; it could be next week or it could be a thousand years from now. But certainly this is a situation, which is untenable and needs to be resolved in a dam. You do not want water moving through your dam for obvious reasons. Chris Martenson: Well, two things then. First is it being monitored I guess if so how. Second how does one go about fixing something like this? Scott Cahill: That is an interesting one. I am glad you asked that question actually Chris because I should have brought that up. There are things called piezometers and they are instruments which measure the depth of water within the dam. It is called the phreatic surface and it is basically the same as the groundwater table on the earth but it is on this dam it is shaped like half of a bell so a bell curve if you will. That should never manifest come out of the dam higher than thirty percent up. That is very important. You can watch the depth within these piezometers. Sometimes they are wells, often they are transducers and you can see if you start to get a swelling or a blister of water where the phreatic surface is raising. So, these are very important things. This dam once had fifty-two of them. I understand that they are down to one or two now that work. Chris Martenson: One or two. Scott Cahill: And this has been ongoing. Yeah it is just bizarre. Again, the tallest dam in the United States of America. The maintenance history of this dam is abysmal it is disgusting and this is something that we desperately need right now are piezometers so we can understand the depth of the phreatic surface through this dam, again, which has a direct association with being able to compute the stability of the dam. Without that data and with all these piezometers broken, as they are, all but one or two of them, it is just a ridiculous situation to find ourselves in. Chris Martenson: We were down to people going out there, squishing their boots down, and measuring the rate at which the boot hole fills [chuckles]. Chris Martenson: Did you bring a stopwatch? Scott Cahill: Yeah we walk around in a jungle in a desert and then we go back to the office and say – I think it was just rainfall. Just words escape me and my consolation on this is the report that was put out by this Doctor Bea. I hate to say anything nice about anyone, as you know, I just hate that. This guy is a really brilliant guy, and he did a beautiful job of evaluation. We do not agree on everything, but what he did was scientifically sound and he offered his information to these people, as did I, and he became very frustrated and said there is no point in writing anything else because no one listens. I understand that feeling, but he was exactly correct in the assessment of this dam. The culture will not allow this dissention and time and time again, for instance, the guy Mr. Croyle [ph] retired and they brought one of the underlings up into that position. They were asked to get an outside engineer to evaluate it, they hired the predecessor to Mr. Croyle. It is all within this culture and they are all patting one another on the back and saying you are doing great. Meanwhile, the dam is in horrible, horrible, horrible situation. One day it will rain again. I promise you, you and I will be talking again my friend. I hope not, but I predict so. Chris Martenson: …I did not end up reading that article yet but I am hoping a- you can provide the link so we can take that report. This Doctor Bea, tell me what was his main conclusion? What did he come up with? Scott Cahill: He decided that it was a problem of maintenance and of culture and that until the culture changed nothing would change on the dam and it would never be safer. I agree completely. That is the same assessment that I had of it. He had a number of engineers and dam safety officials that consorted with him to develop this thing. It is one of those things that is an obvious assessment but he went through the methodology professionally and produced a document and it was exactly what I believe and what I believe to be correct and was done in a very professional manner. It at least documents the things that have been said by many professionals about this ridiculous situation of Oroville, which shockingly, threatens the lives, and livelihoods of millions of people. This is a potentially horrific situation that needs to be taken seriously, that is controlled in an environment of, I do not know what to call it. But a culture that does not take it seriously. Chris Martenson: Alright, so we never quite got to it, but how would somebody remedy something like this? I remember reading lots of reports about the Mosul Dam in Iraq, where they were very concerned because ISIS had come in and there were dam engineers there whose daily job it was to probe with these drills into the eroding, I believe it was some kind of limestone base that this thing is built on. But at least some sort of erosive rock, and then they would have to grout into there and it was very sort of artsy rather science. These people with decades of experience would probe down with a two-inch drill and find a big empty spot and push a big probe down there and grout away. If they did not keep doing that, the idea was that this dam might fail from the bottom up. So, I know there are ways to sort of remedy a dam that is already built that has maybe some erosion happened. What would be the process for this sort of a dam? Scott Cahill: Alright you are very accurate on Mosul by the way, that is pretty much the way that works and you are also unfortunately accurate on the fact that the science is more an art than a science. I am one of those people who has grouted many, many dams and that is one of the things that I have done a lot of, and that is the issue with this dam. The grand issue, there are a number of things that could fail this dam. Of course, over topping the emergency spillway would only take minutes to take the dam out, even still. And the failure of the gate structure at the top of the primary spillway would take the dam out. I do not know to what degree, but the underlying issue, which you have nailed, is the need for an extensive investigatory and then grounding program to address this movement of porting water and phreatic water through this dam in the indigenous soils on the sides of the dam, the groin if you will. That is the issue. They should be drilling and filling, drilling and filling. A friend of mine who is a great engineer said to me – Scott, when in doubt grout. This dam needs grouting worse than any dam I have ever seen, probably with a urethane type of a grout to bind and to fill these areas where fines have been walled through by this water that seems to be moving through this dam. Chris Martenson: And what would be the expense of a program like that do you think? Just ballpark is this millions; tens of millions; hundreds of millions, what are we talking about? Scott Cahill: I think you are probably about a hundred to a hundred and fifty million-dollar project to do the entirety of the dam. But when you compare that with a hundred million dollars per month expenditure early on flying rocks over and dropping them in holes, it is not particularly significant. This unfortunately is turning into a very expensive endeavor, which is going to take much longer than people are pretending and it is going to cost much more than people are pretending. The important thing here, when you are talking about literally national viability. If we lost this and lost all of the crops and all of the business in a good section of northern California, it would be crippling to the entirety of our nation. This is something we cannot allow to happen. Even though these seem in magnificent numbers, they are not and a hundred million dollar grouting program is money well spent. And had they spent that, they would have saved the hundreds upon hundreds upon hundreds, probably more that they have spent already on this dam. Chris Martenson: Alright, well let’s turn now to the wonder across the face of the dam to the other side. You have mentioned a few times that you have concerns over by the gates, as well. What are your concerns there? Scott Cahill: Well, the gates are shut down with signs of the same situation of water porting beneath them. Those signs manifest as the structure itself cracking and fracturing. These cracks - some of them are sixteen feet long. One of the gates has so torsionally rotated in its failure that the gate no longer opens and closes properly. Scott Cahill: And it is gault against the sides. These magnificent structures I mean they are huge, they are in a process of failing and they are failing because the foundation is failing which the most probable reasoning for that is because there is water moving beneath it removing those fines and allowing that foundation material to become displaced and allowing this thing to settle. There is also indications from what happened when the emergency spillway occurred when it actuated it and failed at three percent of its flow, which I find unbelievable. There were a number of holes, caverns if you will that seemed inappropriate to the topography; that seemed to show that there was water moving beneath the soils and displacing surface soils, as well as across the surface of the soil. I cannot know if that is true or not because you cannot get information but it appears to me and that is what I believe is happening here. So I believe that that is probably a greater issue at this moment than the green spot, which is clear on the other end of the embankment of the dam in the left groin. I am much more worried about the gate structure and, of course that could have been replaced in this season had we done that instead of rebuilding the bottom of the principal spillway. That is what was done, instead. Chris Martenson: That was what was done instead because there was not enough manpower? There was not enough money? Was this a prioritization; we can only do one thing so we are going to do that? Or did this just not somehow float up…? Chris Martenson: …the decision tree somehow. Scott Cahill: Yeah, it is conjecture but I imagine that it was a perception thing. I imagine that they said the bottom half of the spillway is gone and everyone can see that. So, if we replace the bottom half of the spillway, which is gone completely, then people will have comfort in seeing this spillway back. Rather than saying what is the most probable failure mode of this dam and fixing that first and then stepping down to the next and the next, which is in my belief the proper methodology for repairing a dam. The first thing you fix is the thing that is most likely to create a catastrophic failure. That is the first issue. If the bottom of the dam is ugly for a year or two and if the principal spillway actuates and it washes a bunch of dirt into the Feather River, that is not good, but it is better than losing a dam. I would be concerned and am concerned about that gate structure. And in Doctor Bea’s report he felt the same way. also. So, I am not the only one that feels these things. But still that culture persists at that dam and they are making it so it will look nice. It will be pretty concrete but it will not be any safer than it is now and that is what concerns me so much, Chris. Chris Martenson: I think everybody living in the shadow of that directly and all the rest of us indirectly because as you said this would have national significance should it fail. I would imagine most of them are holding on to this idea that there are experts in charge, that the right things are being fixed in the right order. We are not being how would it…almost random about this. We are not doing for optics right, we are doing this because of sound engineering. When I get a on a plane three million parts on that plane I like to know that all those parts are working as necessary and trust that that is actually being done here. You are kind of making it sound like if you take a good hard look at this it is kind of like we have airplane mechanics here who are putting decals on the plane when they think there might be an engine problem. Scott Cahill: Bingo, exactly. The people who believe that responsible people are addressing this in a responsible manner have a right to believe that. They should believe that. I wish it were thus, but it is not. The people who are controlling this thing have a culture, which has persisted for a very long time. The people they put in charge time and time again; they have stayed within their culture, rather than going outside and attempting to make changes to that. So yeah, I think your analogy is spot on. The airplane, the engines are rolled, the turbines are out of balance, the engines catch fire now and then and it has a beautiful new paint job now. It just does not help the safety of the thing that much to have the bottom of the spillway repaired. That was never the problem. Chris Martenson: Alright so let’s think about how to sort of summarize this then. First off with a letter grade A being great, F being a total failure where are we on this dam? Scott Cahill: Somewhere in the lower D’s. Chris Martenson: D/D- somewhere in there? Scott Cahill: Probably, yeah D- I will give them a D-. You know the spillway failed and the emergency spillway inoperative, I probably would have given them a D and only because it probably will not rain that much. That is the thing that everyone must recognize here. The design storm for which this dam was designed is far beyond, like seven times in volume beyond the water that this dam will pass if everything holds and there is no reason to believe that it will hold. The dam has serious issues and it continues to have serious issues. The work that has been done; it may get completed it probably will not get completed on time, it does not matter. The point is when it is completed the dam is not safer than when it was started. They have been using explosives to remove concrete; these things are things that are not typically done and are actions that are irresponsible, in my opinion. So, they do not respect the liability of that dam and it is a cultural issue and that has not changed. If we get to the point years down the road where the structure is replaced, where a grouting program has taken place, then that dam can be as safe as any dam in the world. It can be a magnificent dam. But until those things take place we are carrying a liability and we are simply hoping that that storm does not come. Chris Martenson: What kind of a storm would this be in the context of things? I mean it was kind of a pretty good storm that Pineapple Express that came through dumped many, many inches into that watershed. What kind of storm do you think would be concerning here? Scott Cahill: Yeah. The storm that the dam is designed for is called the Probable Maximum Storm producing the probable maximum flood. It is a storm of great magnitude. Of course, it does not matter because the dam now will only pass a small percentage of that storm which the dam was once designed for. The assumption for that design storm; what that would look like would be the emergency spillway that had failed with about a foot of water passing over it would have sixteen feet of water passing over it for a long duration. You can imagine a wall of sixteen feet of water over that entirety of that emergency spillway, a huge storm. But the scary thing is that this dam would be failed now by a storm that is nowhere close to the storm that these dams are designed to pass because it has no active emergency spillway. Effectively the emergency spillway will fail shortly after it is actuated, and the principal spillway which is the only way of passing water over that dam except for through the turbines of the power plant, if it is actuated it may or may not hold. I do not want to be extreme here, but it is not a good situation, it is not even an acceptable situation. Any Dam Safety Official would have a serious problem with the way that that dam now stands. Chris Martenson: Now I remember at the time when we were looking at the principle spillway and you were pointing out that it was not just the obvious defect, the lower third of it got chewed up and washed away. But that all the way up the entire spillway there were these drains on the side, on the side curtains where the water was just pouring out these drains three or four feet up the side of the spillway. I do not know how high those were, maybe they were ten feet, I could not get the scale. Anyway you were saying that that meant that water was moving where it shouldn’t be. It was moving behind the curtain, under the spillway. Obviously that was true because of how the damage and the lower part failed clearly something was wrong under this spillway all the way up to the top. Chris Martenson: Has that been fixed? Scott Cahill: All the way to the top. I do not know the answer to that, Chris. Scott Cahill: And that is a ridiculous statement for me to make. Has it been fixed? Indeed, I do not know. They do not talk much about these things. I see from photographs that some rock bolts have been put in the slabs at the upper area to tie the slabs down to the rock, such as it is. Because the bar that were used failed obviously because the plate slabs failed on down. Hopefully, they have grouted those voids, there were serious voids, large, large enough to walk through voids up under that spillway. I have questions of how far do they go. I suspect they go the whole way to the gate structure itself, and I think that the realities of the issues with the gate structures document that. But I do not know, and I cannot know simply because the information is not given to any of us. Although, my heavens, we have the right to that information. Chris Martenson: Oh of course. Now let’s talk about the people that have the most right, the people living downstream. What sort of preparation should they take? Would you personally live downstream? What would we be communicating to people who are potentially in the floodwall if this thing did give way. How alarmed should they be by that D- at this point? And what should they be doing? Scott Cahill: Sure, that is a good question. I want not to be an alarmist, but if my own opinion of how I would handle, it I would not be concerned at these lake levels. But if the lake went up again to the upper eight hundreds, the top of that emergency spillway is at an elevation of nine hundred feet above sea level. If the elevation got up into the eight hundreds, let’s say eight-fifty, I would start getting quite concerned. At the point when the elevation is nearing nine hundred it will be too late to pack the car and get out of dodge. If I saw that the lake was being allowed to fill to those upper levels again, my personal feeling would be that I would evacuate regardless of what anyone told me. But it is not my place to tell people that, but that is what I would do for sure. Scott Cahill: I would not stay there with that thing flirting with nine hundred. I would have been long gone before that. Chris Martenson: So, you may or may not know the answer to this but I am just wondering the official statements are – this is safe; we got it under control; it is all good. Insurance companies have different metrics. Is it possible do you think to get flood insurance downstream of this dam at this point? Scott Cahill: That is an excellent question too Chris and I don’t know the answer to it. I can tell you that we thought about the insurance companies because they have a vested interest in this, as well. If I were writing the insurance I would not be writing insurance there right now for flood. That is underwritten by the Federal government, as I understand it, and I do not know what the situation now is for flood insurance in that valley. Certainly, it would be a wise purchase for the next few years until this thing is under control for the people that live there because it will be a horrific loss. And even with insurance, with the loss of that size it will be a difficult situation if failure should occur. It will be horrific, it will be life changing for every American if we allow that dam to fail. Chris Martenson: Yeah. I am sure even if you had insurance it would be either small comfort or useless comfort at that point in time. I was just wondering if that was, I know that insurance companies have their own ways of assessing risk that sometimes, like the military, they are a little more clear eyed about what is actually going on. So, it is a place to sometimes go and get some additional information on the actual nature of what is occurring at this point in time. Scott Cahill: Yeah, absolutely, absolutely. I don’t know the answer unfortunately to whether insurances are available there or not. The liability is very real and the liability has not been abated. I wish it were otherwise. Money has been spent but we have not addressed the things that I feel are the prominent things, which need addressed. Chris Martenson: Alright, well Scott thank you so much for your time today. This is a fantastic summary, a great update. And I am a little bit disappointed but not surprised to discover that after all of that attention; after all of the concern that a more organized, more rational and more transparent process has not been followed here at this point in time. Such that somebody as involved, as concerned and as knowledgeable as yourself can say – I don’t know where we are on that part of the fix it process. It is certainly concerning but I think also emblematic of many things that we see going on in this country today, where sort of like well we will just patch stuff up. We are going to kind of do it on the cheap, we are not really going to take the right answer. And it is just astonishing to me to see this being sort of taken over and over again because it is certainly not the narrative we tell ourselves about who we are as a nation and about how we are number one and all that. My travels in the world show me conclusively that we are no longer number one in a lot of dimensions, including infrastructure particularly. Infrastructure is something that you have to constantly maintain and constantly reevaluate all the time because it is not a one and done, you do not build pyramids and they last five thousand years we are not building those anymore. Everything else is a building project that is like a house, you have to paint it, watch things and if the foundation settles you have some decisions to make. So, that is sort of been my observation is that I watch the structural engineers hand out D/D- grades to the United States infrastructure year over year over year. You have been on the front lines of that and I think this is a fascinating case study to help us understand larger picture of what is going on in many other places as we talked last time both in dams but in bridges, waterworks, you name it. Chris Martenson: Thank you so much for your time today. Scott Cahill: Thank you so much for having me, Chris. I enjoy being on your thing and I enjoy very much the discussions that you and I get to have. Chris Martenson: Well thank you and for the people listening who want to follow much more closely what is happening with the dam, where are the best places for them to do that? Scott Cahill: Certainly, they can look me up on LinkedIn or Facebook and I blog on it from time to time. I only blog when something changes, generally. But it will keep people up to date on what is happening. YouTube also, we have a YouTube channel and I invite people to keep an eye on that. I do suggest to people Doctor Bea’s report I thought it was a very well written report and I have not seen many of those lately. Certainly it is a good thing. Chris Martenson: Fantastic, make sure we have the link to that and we will put that at the bottom of this podcast so people can check that out. Again, Scott thank you so much for your time today. Scott Cahill: And thank you Chris. CA builds a metro high speed train instead of repairing the Oroville damn. US bails out criminal banks instead of fixing government spending and Wall Street. Juan continues showing images progressing down the spillway and discussing the ongoing work. At the bottom, he works his way back up the spillway with images taken from the other side. By 10:22, he's reached the top again and then shows California DWR drone footage released 8/17/17. That ends at 12:22. I know from past experience that regulators in charge of public projects are loathe to accept any culpability for a failed project. They normally don't have any monetary incentive to limit their actions, but they will catch hell if anything fails (again.) As a result, they generally go overboard on requirements only to paper their butts in case something fails. Scott was saying that the dam regulators are essentially the dam operators. That changes the dynamic. Now, the regulators have a financial incentive to be reasonable. We'll see if Scott's worries become issues. Since the construction season is short and this project is complicated and large, choices had to be made to split the work into at least 2 dry seasons. They chose to leave the upper spillway and work on the destroyed lower spillway. Reinforcement of the upper spillway has been accomplished. (I can't imagine that an inexpensive technology like ground penetrating radar wasn't used to locate and identify voids under the upper spillway.) I haven't seen any footage where work was being done on the spillway gates. Until Scott mentioned it, I didn't think it was an issue. As far as the emergency spillway is concerned, Scott is right that 3% of the design flow almost caused the dam to fail. This isn't hyperbole! The head cut erosion near the north end of the emergency spillway was getting close to the weir foundation. (That is what prompted the emergency evacuation orders in February.) To stop that erosion, the dam operators opened the spillway gates wide open and caused all the damage to the spillway. Part of the repairs has been to install a cutoff wall down slope from the weir (to keep head cutting from impacting the dam) and also to cover the erodible rotten rock with concrete. The cutoff wall is complete except for a section under power lines. Until the power has been rerouted, the drills can't safely operate that close to the high voltage. There's still lots of time for this particular phase to be completed before the rainy season begins. There's lots of work to be done before the rainy season begins. We've got about 10 weeks to go. More On The "Green Spot"
Re: More On The "Green Spot"
The news report comes from England! TPTB must want it to collapse to create another diversion for the masses. Trump should declare an emergency and have the FEDs take control. But he probably already is bought out; we will see tonight. The article you linked makes it seem like the green spot is a new feature. It isn't. You can check on Google Earth and see that it was evident in 1998. That is as far back in history that Google Earth has past photos available for this location. The greenery is much more evident in spring. The green spot dries up and turns brown by June/July. If water were flowing through the dam, the vegetation wouldn't dry up and would be much more evident in the dry season. Earthen dams can be quite variable in composition. There was likely a change in material composition near that point that gives it a higher field moisture capacity. Perhaps that area had more fine aggregate or plasticity (but still within construction specifications) than the surrounding areas. It could be that innocuous. I'm not saying it is good for this to happen, but it is not automatically bad either. Here is a stylized cross section schematic of a typical earthen dam from: https://image.slidesharecdn.com/earthendams1-140310035008-phpapp02/95/earthen-dams-26-638.jpg?cb=1394423561 The green spot is approximately where the downstream "Riprap Protection" arrow points. As an uncle used to tell me when I skinned my knee, "it's a long way from the heart." I'm not sure that Scott would say age is a plus in this case. As I'm not an engineer and so am very leery of speaking for him, I believe he said in the interview that the 'multiple' signs of foundation pressure (migrating water through the dam) he observed while at Oroville had likely been there for some time. His concern seemed to be that -- given enough time -- these could eventually undermine the embankment's integrity. Now, you may be right that any seepage is too small/far away to risk a breach. But the fact that a highly-experienced dam safety engineer like Scott is so concerned, as well as is a 15-member team from Berkeley that published a 124-page report on this very risk, is enough for me to be comfortable that it's a topic worthy of discussion. As always, any data/evidence/sound theories to the contrary are welcome. I think your video from Juan Browne is a good addition to the discussion -- although there's not much in it to refute or support the foundation pressure situation (his camera shot of the embankment was so distant that even though a green spot isn't apparent, it can't be ruled out, either, IMO). Having no real engineering expertise or on-the-ground experience at Oroville, though, I'm not qualified to weigh in authoritatively on the green spot issue. To that end, I've invited Scott to chime in here in the Comments. I can't guarantee he will, but he did so with the earlier podcast we recorded with him, so I'm hopeful. Lots of news articles lead the reader to panic because they lead the reader to think it is a new problem that just manifested itself. I get angry at those alarmist pieces. This problem has been around at least 19 years and likely longer. Is there degradation in that time? Will this problem destroy the dam? I don't see it as a huge issue. By the same token, I don't expect the dam to last forever. In fact, I bet that it will fail within a billion years. It likely will fail much sooner. Of course, so will every other man made structure. Then again, so will every natural structure. We (and nature) don't build things to last forever. We can't afford to do so. Risk is just a fact of life. All earthen dams leak. How much and how muddy is the key. Also, the filter water will become muddy before the dam is in jeopardy of failing. Are the operators reporting problems? I haven't heard of any, but that doesn't mean there aren't any. For a core breach to be evident on the surface of the dam about a third of the way down slope, lots of really bad things have to happen. First, there has to be a core breach. Then, the fines from the core breach have to plug up the filter with fines. Then, the fines have to plug up the armoring riprap so that water would find it easier to manifest itself on the surface rather than percolate through the dam structure unnoticed. Why would this water only manifest itself in the springtime? That simply doesn't make sense to me. That the green spot has existed for some time is rather comforting. It was likely a result of construction material variability rather than a manifestation of a new problem. I'm not someone who believes everything that government says. I question motives behind events and reporting of events. In this case, I haven't seen any evidence that would cause me concern. I haven't looked at the head gate problem that Scott mentioned, and frankly, I see that as a greater potential issue than the green spot. I also agree with him that the emergency spillway issue could have destroyed the dam. That problem is being addressed. Problems were identified and have been prioritized and the highest priority problems have been and are being addressed - at great cost. As I mentioned in a prior post, there is too much work to be done in one short construction season. Some work has, by necessity, been delayed until next year. Everyone is betting that this next winter weather will be less severe than last winter's weather. Contingencies are being engineered into the temporary construction products in case the winter is more severe. I haven't seen (nor looked intensely) where federal monies have been spent on the repair efforts. The repair costs should be borne completely by the dam operators and their stockholders. Had they maintained the dam properly, none of this would have happened. Since they chose to delay maintenance, they should be held accountable for that decision. Bailing them out just reinforces that they can get away with shoddy decisions. That means that the public can expect shoddier decisions in the future. Their financial based decisions impact the lives of all the people downstream of the dam. Downstream isn't just confined to the Sacramento River channel. It is the whole broad valley that is potentially impacted. All of those people have a stake and should be concerned that sound decisions are being made. Adam, I would enjoy conversing with Scott on this forum. I have a background in geotechnical engineering, but my work experience wasn't with dams. (Nevertheless, the fundamentals still apply.) Scott has insights, based on his experience, that I simply don't possess. I will question him politely but firmly. Absent his involvement in this forum, I will post my concerns with his stated positions. What else can I do? I am aware of the rock anchors that were placed in the upper spillway back in the Spring. I am also aware that some repairs, apparently minor, have been discussed for the gate structure. The details have not been disclosed because they are conveniently Secret. FERC has questioned the condition and age of the gate mechanisms themselves in a number of pieces of correspondence that span several years. I doubt very much that any significant repair will be done to them this year. The concrete structure that houses the gates has major structural issues that I also don't think will be addressed this year, although some minor concrete repairs might be made. 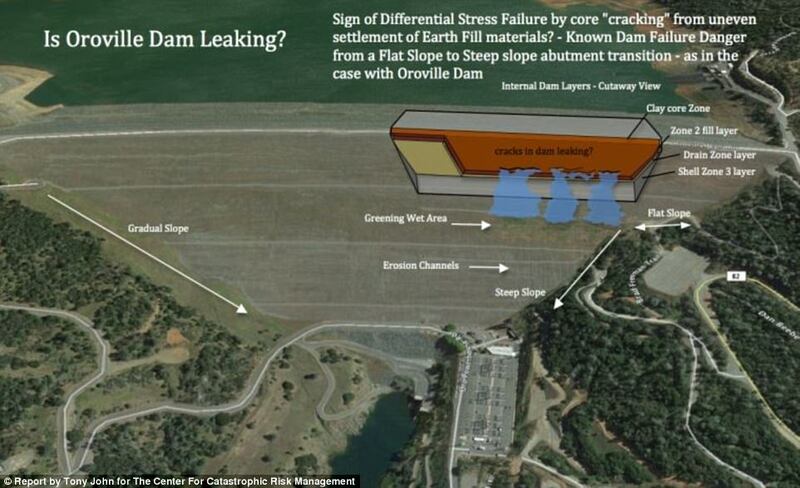 There is undoubtedly a large void under the gate structure and upper spillway that critically needs to be properly filled in order to help stabilize the structure. The binding and misalignments of the gates as cited in the inspection reports year after year, and the large crack and other cracks as well, are a result of loss of support under the structure, alliowing it to shift in normal operation. There also needs to be a cut off wall UPstream of the gate structure to prevent future migration of water under the structure. The gate structure is the greatest point of vulnerability for this dam in the upcoming season. As for Mr. Brown, his photos and videos, although selectively chosen, are appreciated. In our view, his credibility slipped a bit when he changed his tune. Initially he was quite critical of DWR, as was warranted. Then he magically became their cheerleader overnight. In recent months, it seems he has moderated back a bit to be less than 100% favorable to them, but still inclined to see positives, ignoring the continuing conditions that put people downstream at risk and the various credible reports, such as Dr. Bea's, that highlight and illuminate them. The green spot, an evolution of porting water through the surface of the tallest dam in America is serious, but there are many failure modes going unaddressed on this dam. Juan Brown is a great way to hear what the DWR wishes you to hear. They have hired a public relations team to "spin" the issues. They have public meetings where they employ Delphi technique to quiet an misdirect the conversation. They do everything but maintain and repair. A quarter of a Billion or so has been sent to CA to plug the holes in the Oroville Dam by the Federal Government. The Billions of wasted money are the result of irresponsible stewardship of a major element of infrastructure and a culture that is a failure. Already hundreds of thousands of people's lives have been put in jeopardy. When confronted with their failure they have misled and lied and redacted documents. When men like Dr. Bea offer help they ignore them, then marginalize their words. Even with this horrible bungling of responsibility, I, like Dr. Bea see nothing improving. My words speak for themselves and time will show who was right and who was wrong. Thanks for participating in this forum. I'm angered that FEMA is pumping money into the dam restoration! The idiots who decided to postpone maintenance should be held accountable​ fired! The firing should start at the top and work its way down to any level that had material decision making power. Until the other dam operators know that their cushy, high paying job is in jeopardy for not making appropriate decisions, they will never change their modus operandi. Before I comment any further, I'm going to read Dr. Bea's report. For anyone else interested, I found the 78 page report embedded in a .pdf reader in this article: http://documents.latimes.com/report-finds-serious-design-construction-and-maintenance-defects-oroville-dam-emergency-spillway/. I read through Dr. Bea's report that was included in the link I posted in #11. I'm not sure that is the report you were referencing. Almost all of the report concerned the deplorable condition of the existing spillway. There was a brief mention of the head gates, and nothing about the green spot. Would you mind posting a link to Dr. Bea's in-depth report? I liked the title of your post - "Stop Fearmongering." Thanks for posting that Juan Browne video. I would have posted it if no one else had. Although Juan isn't an engineer, he's got a good eye for noticing critical features. He's taken the approach of showing the news about the construction features that he considers significant. In my opinion, he does a much better job than any other "news" source out there. It looks like the new spillway is heavily reinforced with rebar! (Steel reinforcing is a double edged sword. See Our Future Is (Literally) Crumbling Before Our Eyes for examples of the other edge.) The concrete is much thicker than the original spillway and Kiewitt has gone to great pains to remove eroded bedrock before placing the concrete. That will form a stronger bond between the concrete and the competent bedrock. In the short to medium term, these are good measures. Juan was part of the news conference where one of the questions (not his) concerned the green spot. The answer was that the green spot is being investigated and a report is due out in a couple of weeks. Juan also noted that 900 rock bolts have been installed in the existing upper spillway and that twice as many more are scheduled to be placed before Nov. 1st. That should provide some risk mitigation for spill releases this winter season. Of course, all of the upper spillway will be rebuilt next construction season. Juan also noted that the reservoir is currently at about 763' and is planned to be at 700' by November 1st. That gives them at least 160' of freeboard to work with. The dam operators will do everything in their power to keep from using the spillway this winter/spring. After all, why tempt fate? Unless Northern California receives another record breaking wet season, they should be able to meet that goal. Human nature is to bar the barn door after the horses escape. In essence, lots of horses escaped in February. In an earlier life, in 1969, I was given a guided tour of the entire California Water Project, from Oroville to Los Angeles. At the time, I was doing the design and cost estimating for a similar project in Texas. An incidental additive note to a post above: The purpose of the rock and random fill outside the clay core is to add mass to resist the horizontal force of the water against the embankment. Gravity. You have the weight of the water times the depth as a horizontal force acting against it. FWIW, the rock fill was a "re-cycling" of waste material from the gold-mining days. While any failure of the dam would be a horrible local problem, the loss of irrigation water and of electrical generating capability would be a statewide long-term problem. Not just at the Oroville project but down at San Luis as well. And lesser, at the downhill recovery after the Tehachapi tunnel. Apologies for the digression. Cross-fingers. We surely don't need another Fort Peck disaster. 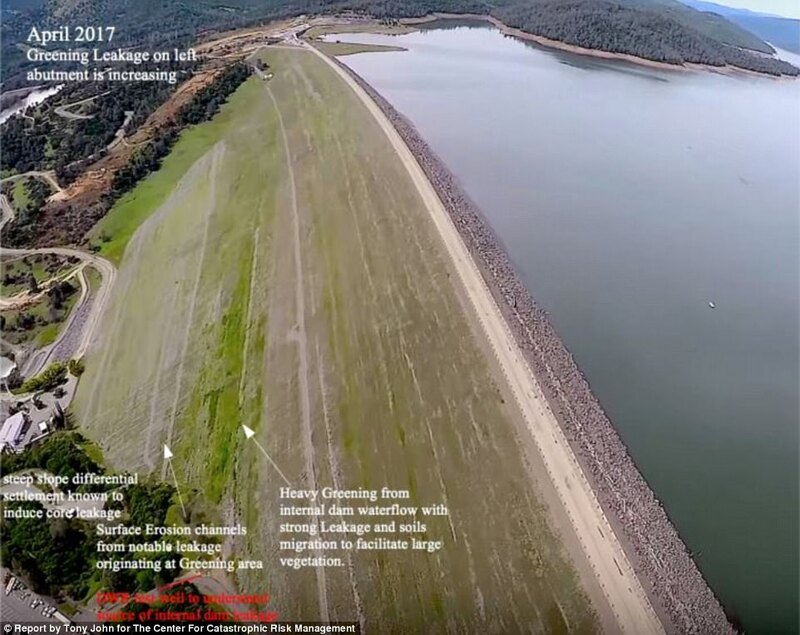 Regularly updated information on the Lake Oroville Spillways Emergency Recovery Project is available at http://www.water.ca.gov/oroville-spillway/ and should be a valuable resource for future guests and your podcast audience. We've invited the DWR to appear on the PeakProsperity.com podcast to provide whatever clarifications/updates they may have. No word back yet on their level of interest in doing so. Per usual, we'll keep you updated as we have more. Juan Browne just posted his latest video of a boots on the ground tour with the engineers. This includes a discussion of what led up to the failure and a walking tour, detailing the rebuild construction. no fear mongering, no conspiracy theories... just facts and data folks. Juan Browne just posted his latest video of a boots on the ground tour with the engineers. I just came upon a reference to the Arkstorm from the 1860's on the west coast, something that I had never heard of before, so I thought I'd share on the Oroville discussion. I wonder if this was the type of event that the emergency Oroville spillway was supposed to, by design, accommodate, remembering hearing how the emergency spillway nearly collapsed during the spring flooding only after it was subjected to a small percentage of its design capacity. Makes one contemplate the scale of the catastrophe should a similar arkstorm-like event would occur - would be greater than Harvey, I suspect. Think multiple dam, levee, and road infrastructure failures. Based on these two videos, it looks like the spillway work is proceeding apace, and that the repairs have been taken seriously. There are machines and workers crawling all over the place in these videos, and they are running round the clock shifts. The first video notes that twice as much concrete as initially estimated was needed...over 870,000 cubic yards due to solid bedrock being a lot further down than thought. So the price to fix the spillways has also doubled to more than $500 million. A not insignificant number! To these untrained eyes, this looks like solid work being taken seriously. Here is a drone flyover of the Oroville Dam spillway on October 23, 2017. It is only 2:03 minutes long. The roller compacted concrete (RCC) has just about completely filled the plunge pool and they have less than 10' of vertical placement left to tie into the relatively undamaged upper spillway. As Chris noted, the work appears to be of high quality. What would we expect for $half-a-billion +/- so far? Although there haven't been any real updates shown on what work has been performed on the spillway gates, the lake level is near 700' elevation. Dam operators will do everything in their power to keep from using the spillway this winter. Unless we get much more precipitation than last year, the spillway won't be used this wet season. From what I understand, the spillway gates will be repaired next year along with armoring the RCC. Lots more money to spend. 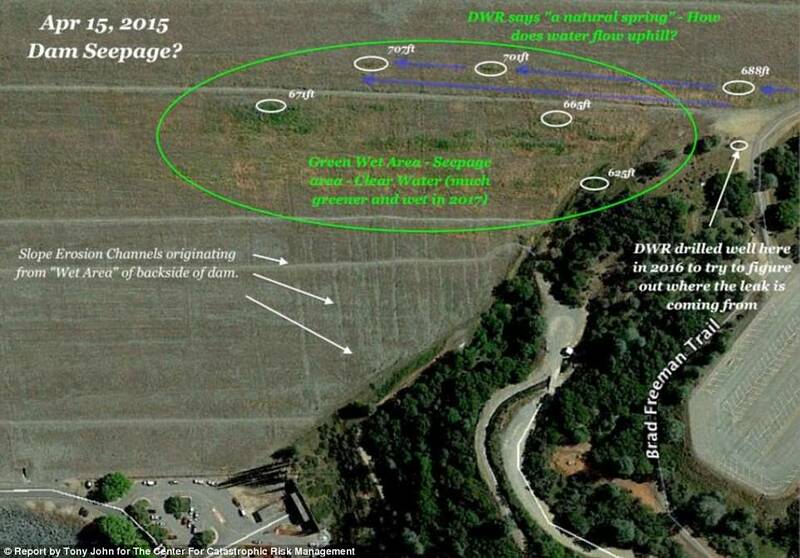 A 28 page report on the "green spot" was released by DWR. I couldn't find it during my brief internet search, but there are quite a few news reports that summarize the findings. In essence, the report concludes that the green spot isn't a concern. It is likely the result of dirtier material being placed inadvertently on the dam face during construction. The spot is not a cause for worry because, in part, it is dry in the summer and green in wet months, every year, the 28-page report states. It also says seepage measurements at the base of the dam have stayed low since original construction. 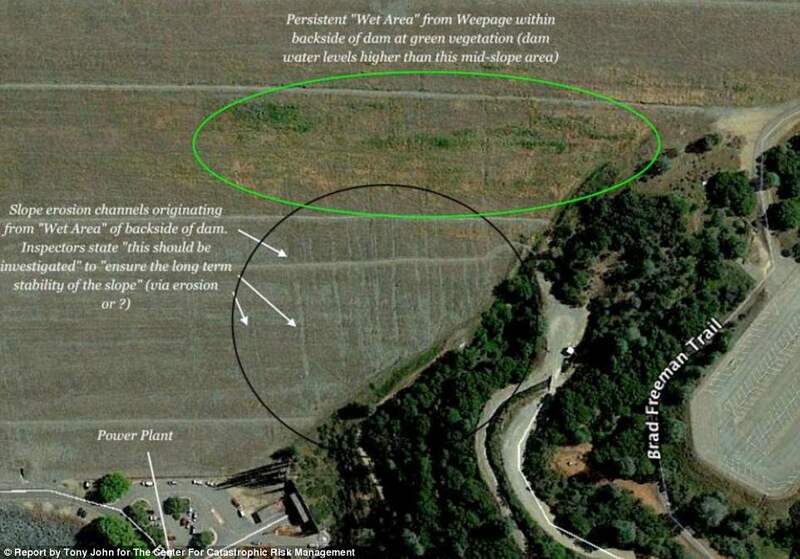 “If any water did make its way through the dam’s core, it would be intercepted by a vertical drain, preventing it from flowing to the downstream area of the dam where the vegetation is located,” Mellon wrote in an email. He said the vegetation area is visible in wet months because rain settles there, and as to why it sits in this one spot, splayed horizontally — it has to do with the way materials were placed when the dam was built. “Dirtier” material was put there unintentionally by a contractor, he said. Harder said if differential settlement were to occur, the original designers planned for a separation of five feet and in the last 50 years, there has been a shift of 10 inches. 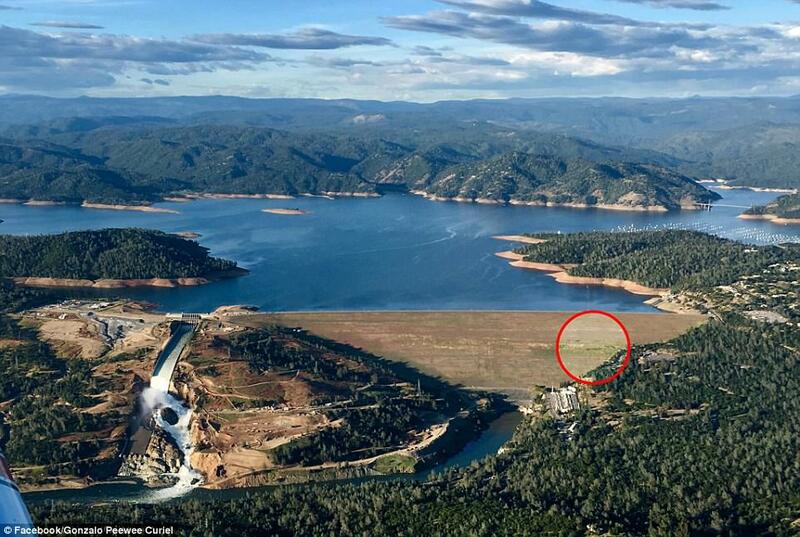 He also added that the “green spot” has been there since the dam’s original construction, before the reservoir was filled, something that DWR officials have previously stated. Seepage through the weir has been measured at 10 gallons per minute during the dry season, which the report notes is “extremely low for a dam this size” and at 100 gallons per minute during wet periods, which has been consistent since original construction, according to the report. Harder wanted to emphasize that several independent groups have reviewed the “green spot” and determined it not to be a safety issue. He said several more reports on the area would be released in a year and a half or sooner. Look at post#5 to see a stylized cross sectional view of a typical earthen dam. Earthen dams have a clay core that impedes water flow and various gradations of coarser materials for filtering and armoring to protect the clay core. Unless DWR is lying about how much water flows through the dam, it is a nonissue. Installing working piezometers (which measure water pressure) in and surrounding the green spot would be prudent and would silence the critics. Focusing on this issue reduces the credence I give to Scott Cahill and Bob Bea. I agree that hundreds of thousands of people's lives were put in jeopardy by the careless actions of those responsible for this dam's safety. Those people should be identified and allowed to spend more time with their families (fired.) Unlike Scott Cahill and Dr. Bea, I see quality construction being performed (unfortunately, at huge public expense) to alleviate the problems created by this disaster. This all could have been avoided if timely preventive maintenance had been performed. That is the bottom line issue. There are many other dams in California and around the Country. Have those dam operators learned anything from the Oroville Dam debacle? Have studies been made and inadequacies been properly addressed in a timely manner? If you live downstream of a dam ... you have a vested interest in the answer to these questions. California DWR released this drone video of the Oroville Dam spillway taken November 1st at 5:30 PM. The first phase of work on the spillway is mostly completed. They have isolated portions to finish and remove equipment to have the spillway ready for use if necessary this winter. That likely won't happen because the lake level is at about 700' elevation and the reservoir has more than 2 million acre feet of storage capacity before the reservoir level gets high enough to require the spillway to be needed. Other work will continue throughout the winter season - weather permitting. Mostly, on the secant cutoff wall in the emergency spillway. Next year, phase II will rebuild the upper section and armor the middle section. There will also be work on the head gates, but I haven't seen or heard what exactly will be done to correct deficiencies. That will likely be decided this winter while engineers can focus on that instead of day-to-day construction activities. The work that has been performed has cost on the order of $500 million. Unfortunately, about 75% of this cost will be covered by FEMA. That means that everybody in the US has had tax dollars siphoned away to pay for this preventable disaster. Had DWR performed needed work in a timely fashion, the cost would have been less than 10% of this; however, managers are under pressure to make a profit ... and maintenance expenditures eat into profits. What a shame. Unless political pressure (to keep the dams safe) exceeds the profit seeking, things will never change. Look at PP threads concerning the disaster as a microcosm. When it was a crisis, there was plenty of discussion about it. When it got down to the mundane repair operations, interest quickly flitted to the next apparent flame of public interest. I appreciate that people like Scott Cahill and Robert Bea are doing what they can to point out deficiencies in maintenance; however, not every problem has the same level of importance. For instance, focusing on "the green spot" allows dam managers to discount their dire warnings. Not every problem is an 11 on a scale of 1 to 10.